The texts of all four songs that have appeared in this column so far came from The Flying Cloud, a songster (simple, text-only song book) printed in 1922 by singer/lumberjack/saloon-keeper Michael Cassius Dean in Virginia, Minnesota. We would not know much about what Dean’s songs (and singing) sounded like if we only had his book. Luckily, in summer 1923, groundbreaking song collector Franz Rickaby, English professor at the University of North Dakota, visited Dean in Virginia, MN. Rickaby transcribed, from Dean’s singing, the melodies and words to 27 songs and took down some sparse but helpful notes about Dean’s life and the story behind some songs. Rickaby’s notes on Dean gave me a starting point to figure out more about Dean’s life, and since so little is known about these early Irish lumberjack singers in Minnesota, it seemed like a worthwhile project. That was my thought back in 2009 when I began searching for everything I could find about Michael C. Dean. Using census documents, newspaper archives from Minnesota and New York State (where he was born) and correspondence with a descendant of his brother, I have been able to learn a great deal. His parents were both from County Mayo. He was born in St. Lawrence County, New York around 1858. By 1885 he was based in Hinckley, Minnesota. He moved to Pine City, MN in 1907 and then to Virginia, MN in 1917 where he stayed until his death in 1931. I have many more wonderful details, but let’s move on to the big news. This July, I came upon an online collection of digitized New York State newspapers. I was using it to find out more about Dean’s family in St. Lawrence County. One day, I was searching for articles about his brother-in-law John Bird when I found the article to the right. It is from a September 16, 1924 issue of the Canton Commercial Advertiser. I contacted Ann Hoog at the AFC and she found a section of the Gordon recording collection labeled “Miscellaneous.” Among hundreds of tracks in that section were two labeled simply “Dean-man” and three labeled “Mr. Dean.” My friend Deirdre Ní Chonghaile was kind enough to go in and listen to the “Dean” tracks and surrounding unlabeled tracks on the reel-to-reel tapes that were made from Gordon’s original wax cylinders in the 1970s. Deirdre compared voices and also sent me first lines of songs which I was able to compare to his book to find matches. It turns out that there are, at least, 31 songs recorded from Michael Dean’s singing that day in 1924 on the tapes! You can imagine my excitement when I found out I was going to hear the singing voice of this man I have been researching for three years! 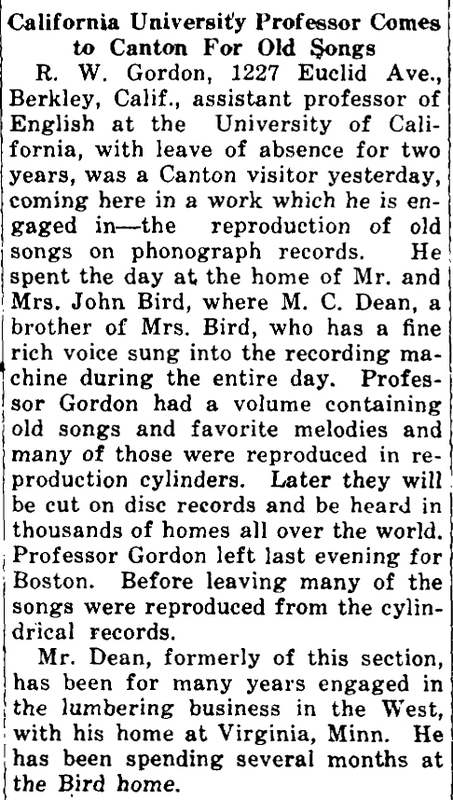 Gordon only captured a verse or two of most songs in order to save valuable space and the sound quality is, well, 88-year-old wax. Still, to hear recordings of so many songs from a singer who was born in 1858 and lived in Minnesota for most of his life is just priceless. I can’t wait to learn every one of them!